While it’s very convenient to just play Genesis games on a PSP, the nostalgic value of popping in a real cartridge has no rival. 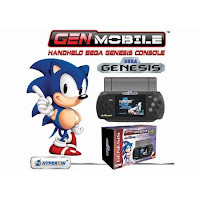 Since Nomads are becoming more difficult and pricey to come by, this GenMobile system looks like a good choice even you don’t have any cartridges on hand, as the system has 20 built-in games. It includes such classics as Sonic and Knuckles, Altered Beast or Ecco the Dolphin. The package makes look like a pretty collectible system. If you are a Genesis fan or just have some curiosity, this is something you may wanna try. Here is a video of Shadow having a little fun. Enjoy.